We are currently completing the assembly of a new test fixture that is sized to test 4.500” rotary shaft seals at pressures up to 10,000 psi. This new fixture replaces a belt-driven fixture that has been in service since 1981. We decided to design the new fixture when the motor on the old fixture began to show its age. The new fixture uses a right-angle drive, which allows it to be much more compact than the old fixture, saving valuable floor space in our testing laboratory. The new fixture was designed by Senior Consultant Aaron Richie and Staff Engineer Indira Grimes, who are posing here with the partially assembled new fixture. Conceptually, it is similar to our RCD seal test fixture. The driven portion of the fixture is based on Aaron Richie’s innovative stacked housing arrangement, which is easily adaptable to diverse types of rotary shaft seal assemblies. This modular arrangement is easy and fast to assemble and disassemble, and readily adaptable to testing many different types of rotary shaft seals in either pressure-retaining or abrasive exclusion service. Testing can be performed with or without our patented laterally floating seal mounting arrangements. The inaugural test on the new fixture will evaluate 4.5” Plastic Lined Kalsi Seals in a laterally floating seal mounting arrangement. This testing is directed at service in cement heads, hydraulic swivels, and oilfield washpipe assemblies. The next test series will explore the performance of a prototype composite high-pressure seal. This will be followed by testing of a prototype variation of the BDRP seal that may provide additional reverse pressure capability. Next, we will perform testing of a variety of barrier seals and partitioning seals installed in laterally floating seal carriers. The results from this extensive series of testing will be relevant to service in mud motors, rotary steerable tools, RCDs, and washpipe assemblies. The new fixture is fully instrumented, for unattended 24-hour operation. The computerized data acquisition system tracks pressure, speed, torque, temperature, and leakage. If data exceeds predetermined limits, the system automatically terminates the test. We have been testing rotary shaft seals since 1979. In a typical year, we conduct over 12,000 hours of testing, which allows us to compare performance between various commercial and prototype rotary seals, and to evaluate various hardware configurations. Our commitment to research is fueled by our constant pursuit of enhanced performance and reliability. 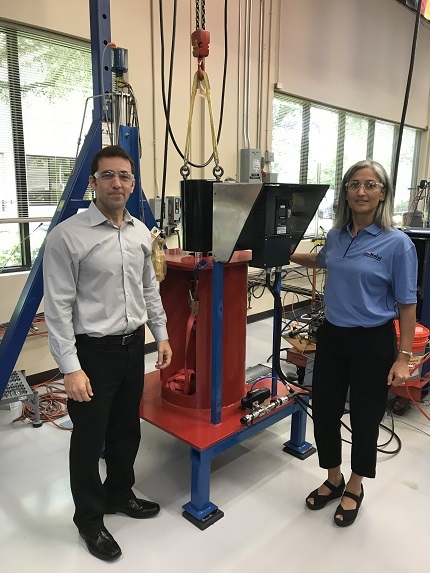 Senior Consultant Aaron Richie and Staff Engineer Indira Grimes designed our new 4.5-inch rotary seal test fixture. This photo was taken part way through the assembly process.